I was so mesmerized by the forecast track of the recent tropical system Sendong, internationally named Washi, that I undertook a little personal research to try to discover if there had been anything similar over the years. 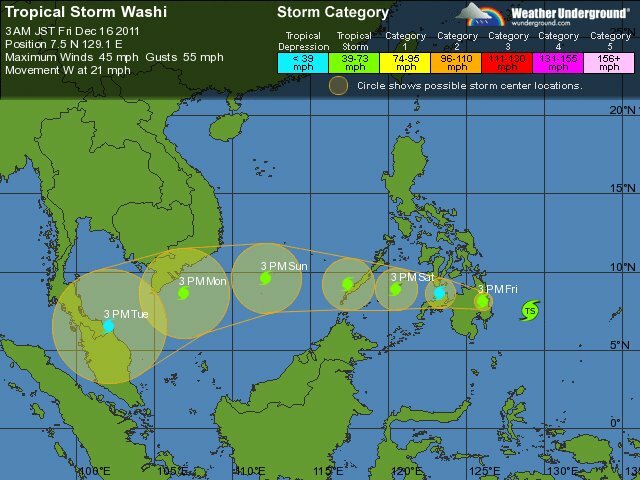 It is not unusual for Western Pacific storms to get as far west as Indo-China; but what I wanted to know was if any of these storms get as far as the Malay Peninsula at all. There was one, I discovered, that wreaked havoc on the northern portion of the peninsula as recently as 2006. Sendong, unless it dissipates or changes course, was forecast to get farther south of the peninsula; and this is so, so unusual. At any rate, one thing led to another while I was in the course of doing research about Western Pacific weather that I ended up discovering things I did not previously know. This post will be all about these discoveries. The reference for this post is data that is publicly available at the Unisys.org servers collated by the Joint Typhoon Warning System (JTWS). The data available is from 1945 to 2010. There is no data available for the year 1970; and I do not believe that it is for a lack of tropical activity that year. At any rate, the available data is sufficient if not entirely accurate to discern patterns or trends, if any. All are advised that I treated data at face value; i.e. the numbers were taken as they were. It goes without saying that data acquired in more recent years would, naturally, be more accurate because of the advancement in the data-gathering technology that meteorologists use. As opposed to information frequently made public by PAGASA, which draws reference from the so-called Philippine Area or Responsibility (PAR), I disregarded tropical systems that entered the PAR but did not actually affect any part of the country. Hence, data cited in this post refers only to systems that actually made landfall or passed close enough to land to actually affect even the outer fringes of the country. There will be some discrepancies in the numbers because the recording for weaker systems in the earlier years was not very accurate. There were also subtropical systems for which no wind speeds were given. This post also refers to all tropical systems in excess of 130 knots as “Super Typhoons.” Note that such Super Typhoons, as per the scale being used, can be either Category 4 or 5 typhoons. A total of 1,874 weather systems developed in the Western Pacific between 1945 and 2010, or an average of 28.39 each year for the 66 year total. There were 360 in all for the 16 year period from 1945 to 1960; or 19 systems each year. For the ensuing decade of 1961-70, there were 331 systems in total; or an average of 33 each year. The following decade, from 1971-80, there were 286 systems or roughly 29 each year. From 1981-1990, there was a slight decline to 277 systems or about 28 per year. The number increased to 344 for 1991-2000; or an annual average of about 34. The number decreased again in the last decade to 276, or roughly 28 annually from 2001-2010. Based on existing records, of the 1,874 weather systems that were brewed in the Western Pacific, a total of 468 or 25 per cent either made landfall or hovered close enough to actually affect land in the Philippines. Of this number, 79 or 17 per cent were Category 1 typhoons; 63 or 13 per cent were Category 2; 43 or 9 per cent were Category 3; 74 or 16 per cent were Category 4; and 41 or roughly 9 per cent were Category 5. The year 1993 has the dubious distinction of being the one with the highest percentage of hits by tropical systems that formed in the Western Pacific. Of the 37 weather systems that formed in the area, no less than 19 or 51.35 per cent found their way to the country. Next was 1995 with 16 of 34 or 47.06 per cent; 1971 with 15 of 37 or 40.54 per cent; and 1964 with 14 of 45 or 31.11 per cent. 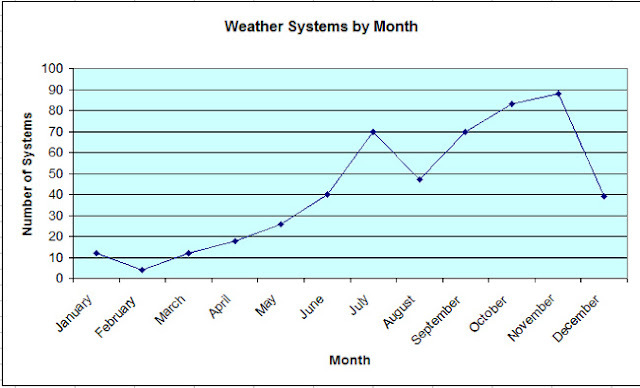 The worst of the weather systems years is completed by 1996 with 13 of 44 or 29.55 per cent. Not surprisingly, February is the month when the Philippines is least likely to be hit by a tropical system; albeit records show it is not impossible. From 1945-2010, only 4 systems hit the Philippines during this month. Curiously, the months of November and October – in that order – have yielded the most number of hits during that 66-period. November has 88 while October has 83. July has a total of 70. Historically, October is the month when the Philippines is most likely to be hit by a really devastating system. In fact, the country has been hit during this month by a total of 15 Category 5 systems, more than any other month from 1945-2010. November is next with 9. 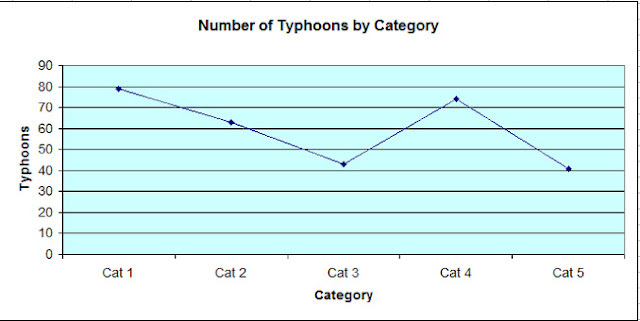 The roles are reversed for Category 4 super typhoons. November has the most with 19; while October comes next with 12. 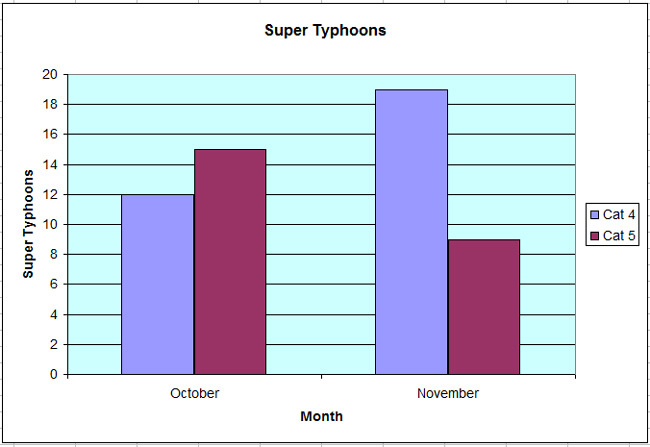 However, the two most powerful super typhoons to have hit the country, both with maximum winds as high as 274 KPH, did so in the months of September and December. Curiously, both super howlers came to visit in the year 1964. The second most powerful typhoon in terms of maximum winds to ever have hit the country was a 266 KPH howler which visited in December also of 1964, arguably the worst year in terms of super howlers. 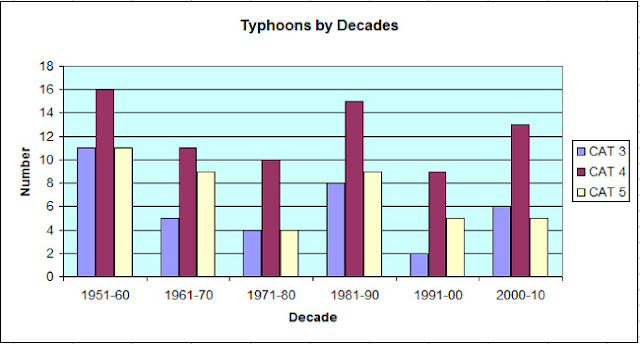 The country was also visited by typhoons with maximum winds of 257 KPH in October 1952, June 1965, October 1967, October 1973 and as recently as October 1997. In all, the Philippines has been visited by a total of 64 super typhoons from 1945-2010, with winds at least 209 KPH and above. 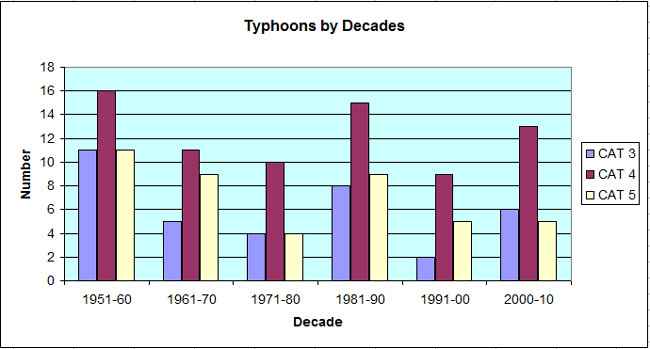 Just to see if there is some sort of a trend and to see if there is any truth to speculation that typhoons have started to become more powerful and more frequent in recent years, I also tried to group the typhoons by decade and also by categories. From 1951-60, there were 11 Category 3, 16 Category 4 and 11 Category 5 systems. The next decade, from 1961-70, there were 5 Category 3, 11 Category 4 and 9 Category 5 systems. Next, from 1971-80, there were 4 Category 3, 10 Category 4 and 4 Category 5 systems. From 1981-90, there were 8 Category 3, 15 Category 4 and 9 Category 5 systems. In the nineties, there were 2 Category 3, 9 Category 4 and 5 Category 5 systems. Finally, from 1991-2000, there have been 6 Category 3, 13 Category 4 and 3 Category 5 systems. In comparison to the nineties, the past decade from 2001-10 did seem to have so many more powerful systems. On the other hand, the numbers are even less than those of the eighties; and even less so compared to the fifties. Since the fifties were also the decade of nuclear testing, I wonder if there was a connection between this and the high number of powerful storms that hit the Philippines. Although the island of Mindanao is not normally part of typhoon alley, weather systems have been known to visit it. Most of the time, weather systems on the way northwest skim its northeastern shores. Once in a while, a system will cut right across it; but these are extremely rare. From 1945-2010, a total of 46 weather systems have made landfall in or skimmed the island of Mindanao. This is less than one each year; and most of these do not really directly affect the island. Before Sendong, the last time a killer typhoon visited Mindanao with purpose was as far back as 1990, when a typhoon with maximum winds of 225 KPH cut across it. However, Sendong’s extraordinary track had it starting deep in the South Pacific, moving across northern Mindanao and south of the Visayas, exiting the Philippines somewhere in Palawan, and pushing remarkably south instead of northwest as typhoons normally do and into the Malay Peninsula. This is not unheard of, as already written; but very, very rare indeed!